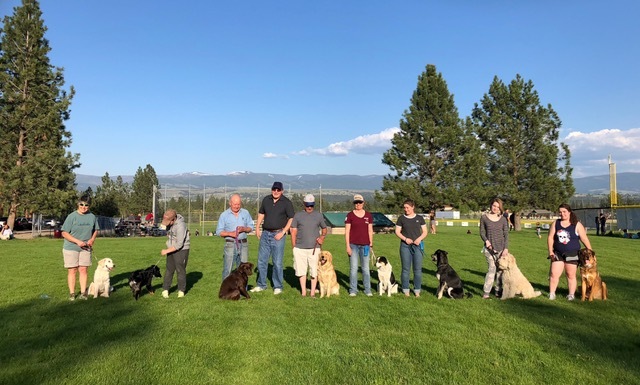 Spring 2019 obedience classes begin the week of March 25-29th! Tuesday, March 26th, in Hamilton at the County Fairgrounds. Wednesday, March 27t, at Florence Park in Florence. Thursday, March 28th, at Fort McCleod Park in Missoula. All classes are basic obedience concentrating on sits, downs, stays, comes, and leash manners. Times for classes this week will be 6:00 p.m. The first session is for humans only; this session will be an orientation. Cost is $110.00 per dog. $95.00 for repeat clients or families with multiple dogs. Please contact me, preferably by phone, if you are interested or have further questions. I look forward to hearing from you. I usually hold group obedience classes in spring and fall and sometimes in the winter (Indoors). Each session usually lasts an hour for a total of 7 sessions altogether. Training is both basic and in the spring advanced classes are offered. Basic classes involve the commands sit, down, stay, come, and leash manners (heeling). In advanced classes more off leash exercises are taught for AKC competitive obedience trials. Novice, Open, and Utility classed are covered. It’s not necessary for anyone participating in these sessions to have to enter any obedience shows, but most of my clients have and usually with success. Advanced class sessions usually last 6 to 9 weeks. Spring sessions for 2019 will begin in late March and if you wish to preregister contact me by phone or email. I highly recommend Gary Kammerer as a dog trainer for either a young puppy just learning his/her basic obedience, or for the older dog needing a tune up or dog handler pair wanting to go on to more advanced obedience work. Gary is fun to work with, and his teaching methods are straight forward and easy for both dog and handler to understand and learn from. I took his basic obedience class with my then 8-month-old German Shepherd, and then went on to more advanced obedience work with the goal of eventually showing obedience. Gary is very helpful in working through problems that might show up during training, and every dog in our basic class finished the class vastly improved from when we all started. Gary Kammerer is a very punctual, committed, and professional dog trainer. I have taken several group and private lessons, where he helped me achieve the AKC Companion Dog (CD) title. He truly cares about every student & canine team and will go the extra mile. I have taken many classes from Gary with some substantial success. One of my dogs has been certified as a therapy dog and one will be ready for competitive obedience soon. Gary's classes are fun and I learn something every time. He knows dog behavior and how to get the best out of owners and dogs. I have also worked with Gary as a co-trainer for a service dog. Again his knowledge of how a dog will respond to various training techniques was invaluable. I like his calm and professional approach very much! My whole family has attended basic obedience with Gary with three active australian shepherds and two immature dachshunds. My grown children and their significant others learned as much obedience as their dogs from Gary's kind, informative instruction.